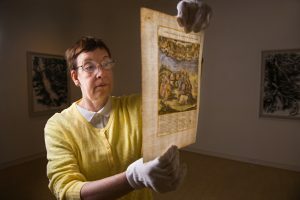 A couple of years ago, Dr. Barbara Rothermel, director of the Daura Gallery, bought more than 60 Renaissance-era folios — basically 16th- and 17th-century book pages — from a print dealer in England. Anyone familiar with Dr. Tiner knows her answer. After all, Dr. Tiner loves everything about Latin. Dr. Tiner spent much of this past spring and summer in Toronto, Canada, as a visiting fellow at the Pontifical Institute of Mediaeval Studies. She has a Licentiate in Mediaeval Studies from the Institute, and also has been a visiting scholar there over the summers of 2012 through 2014. One of her goals this summer was to translate the folios and determine from which books they had been removed. It was a long, complicated process, and when necessary, she sought help from other scholars. “I sometimes started by translating the French, German, or Latin, to get a sense of what the text or image is about,” she said. “Then I looked up information about it, such as scripture in early French or the Vulgate Bible, for assistance with the translation, and then proceeded to identify the book that once held it. Many of the stories and poems Dr. Tiner translated, some of which are illustrated, were biblical in nature. For example, one tells the story from the Book of Genesis of Joseph interpreting the dreams of King Pharaoh’s master cupbearer and baker. Others are New Testament parables, including that of the Good Samaritan. And drains all blood from limbs. (As it ought) envy is always its own torment. An exhibition of the translated folios, “Image + Text in Renaissance Folios,” will open at the Daura Gallery on Tuesday, October 24, with a reception from 4 to 5:30 p.m. At 2 p.m. Sunday, November 5, Dr. Tiner will present a gallery talk, “Image + Text: A Detective Odyssey.” The exhibit will run through December 10. Dr. Tiner began studying Latin in eighth grade at what was then called Gordon Junior High School in Washington, D.C. In college, she studied English at Seton Hall University, and then turned her attention to medieval studies, earning a master’s degree and PhD from the Centre for Medieval Studies at the University of Toronto. In 1989, Dr. Tiner came to Lynchburg, where she taught English and directed the College’s writing center. In 2007, Dr. Kim McCabe, then-dean of the School of Humanities and Social Sciences, asked her to take over the Latin courses that had been taught by an adjunct instructor. Considering Dr. Tiner’s love for Latin, it made sense to have a tenured faculty member teach the course, Dr. McCabe said. “She had the passion. She loves it, still, to this day,” she said. The few Latin classes that were available a decade ago have now grown into the classical studies minor, as well as a Latin Club on campus. Internship, independent study, and study abroad opportunities also are available. He said that she encouraged him and his classmates to find out how Latin is linked to their other fields of interest. “I found this research very interesting, as it showed how each of our fields evolved into what they are now,” he said.